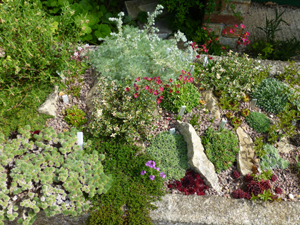 I was fortunate to be given a magnificent (and very weighty) granite trough, so I am dipping into the world of alpines. I remember my father, George Adams, doing the same thing when he got older- perhaps these jewels of the plant kingdom creep up on you at a certain age. I filled the trough with a free draining mix of grit and loam and added some large rocks to provide shade and shape. I have never been a great one for watering - so plants in my trough must be forgiving and resilient. I planted a variety of saxifrages (some flower but others are sulking) and sempervivums, Artemesia caucasica (Silver Spreader), Globularia repens (little blue button flowers), Sisyrinchium angustifolium (Blue-eyed Grass- may prefer a moister site), Rhodohypoxis baurii var platypetala (white) and Rhodohypoxis 'Claret' (deep red), Erinus alpinus (Fairy Foxglove) and Cotula lineariloba (Brass Buttons) with soft silvery leaves and little yellow button flowers. I have also planted up a few pots and have acquired a second trough in which I plan to make a crevice garden with deep, narrow channels that should be perfect for tiny alpine treasures. Alpines do not mind freezing temperatures but hate wet crowns, so plants have to be protected from autumn and winter rain with a cover that still allows light in and air to circulate. The cover must be very firmly attached or it takes off in the winter gales. A bit tricky, but I am getting the hang of it.